Harambee Stars coach Sebastien Migne. 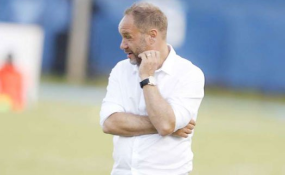 Harambee Stars coach Sebastien Migne is getting deeply frustrated by the government's half hearted support with three months to the 2019 Africa Cup of Nations. The French tactician now says that the national team risks missing out on the facilities he and the federation had identified as venues for a three-week residential training session prior to the start of the Afcon tournament in Egypt in June. Stars have latched from one financial difficulty to another ranging from delayed allowances, delayed coach's salary to delayed payment of outstanding bills, and are still waiting to be given travelling tickets to Ghana for Saturday's final 2019 Afcon tie. "When I read about Kenyan news, it's often about money but never about football. It's a huge problem and we cannot continue like that. "I have given my best for 10 months and my family and I are happy to be here. We share a special connection with the players, but I am a little bit tired. "We now have a bigger medical staff and a larger technical bench and if we are to compete with the best from Africa, we have to get support from the government. This is a very high level competition and to be consistent at this level, we need the support of every stakeholder, including you, the media. "Help us to push for that support. I need the help of all stakeholders because we may end up losing the opportunity to train in France because some other teams also want that facility. Senegal are ready to pay for it even today. It will be very bad if we don't secure it," he said. Migne was speaking at the Moi International Sports Stadium Centre in Kasarani where 25 members of the senior national team had converged for training on Tuesday. Captain Victor Wanyama was among the 14 foreign-based players who had turned up for training. The others were new sensation Christopher Mbamba from Sweden's Oskarshamns, Erick Johanna, Johanna Omollo and Brian Mandela, who has just returned from injury, and underwent a separate training regime to bring his fitness levels up to speed. Stars are scheduled to leave the country on Thursday for Ghana ahead of their last Group F qualifying match of the Afcon against the Black Stars. Kenya top Group F on seven points, one ahead of Ghana, who will be out to avenge the shock 1-0 defeat they suffered in the second round qualifiers, in September last year in Nairobi.